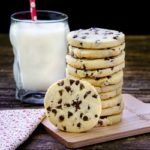 Homemade slice and bake Sour Cream Chocolate Chip Cookies are crunchy with a hint of vanilla flavor and packed with mini chocolate chips. Beat butter and sugar in a large bowl until light and fluffy. Add egg and vanilla and beat to combine. Whisk together flour and baking soda. Add to butter/sugar mixture alternately with sour cream, beginning and ending with flour, beating until just combined. Stir in chocolate chips. Dough will be somewhat crumbly. Divide dough in half. Firmly press and shape each half into a log 2 inches in diameter. Wrap logs in parchment or wax paper. Chill at least 4 hours or overnight. Unwrap roll and cut into 1/4-inch thick slices. Place slices on baking sheets 1 inch apart. Bake for 9 to 11 minutes, until edges have slightly browned. Cool cookies on baking sheet for 1 minute. Transfer cookies to a wire rack and cool completely. Repeat with remaining dough. Prep time does not include time for chilling dough.